Experts have stressed the need for increase in the level of awareness on skills development and practice in Organic Agriculture as the panacea to the problems of food insecurity in Africa. This suggestion emanated at the end of the just concluded International Workshop on Curriculum Development for Postgraduate Studies in Organic Agriculture in West Africa, organized by the West African Network on Organic Agriculture Research and Training (WANOART), held at the Federal University of Agriculture, Abeokuta. Delivering a Lecture on Concepts and Misconceptions of Organic Agriculture, the Project Coordinator, Centre for Agro-ecology and Food Security, Coventry University, United Kingdom, Professor Phil Harris, disclosed that the 2008 United Nations Report observed that Organic Agriculture in developing countries, had contributed to an increase in food security, through the promotion of natural environment, community cooperation and partnerships, as well as increase in education, skills and health care. Professor Harris pointed out that the practice of Organic Agriculture transcended the use of pesticides and inorganic fertilizers but involved embarking on positive, sustainable management process through recycling of residual biomass and the use of biological fixation of atmospheric nitrogen, biological and cultural control of pest diseases. The Project Coordinator debunked common misconceptions, desecrating Organic Agriculture as being old fashioned, but rather, “Organic Agriculture takes the best form of traditional knowledge and practice but develops new scientific approaches and specific technologies,” he noted. He highlighted some benefits of Organic Agriculture to include being environmentally-friendly, safe and sustainable while assuring that the international commercial market for organic products is high. On the Lecture, Promoting Organic Monogastric Livestock Production in Ghana: Prospects and Challenges, Professor Stephen A. Osei, of the University of Animal Science, Kwame Nkrumah University of Science and Technology, Kumasi, Ghana, decried the inadequate official attention given to the development of organic livestock in Ghana. According to him, Ghana is a net importer of meat, milk and eggs of up to $1billion with an average intake of 30 eggs, per year. Professor Osei, identified factors militating against the development of Organic Agriculture in Ghana to include inadequate knowledge and skills by academic institutions as well as low level understanding of the principles and practice of Organic Agriculture. He called for the development of an effective curriculum in Organic Agriculture that will help to adequately train future farmers, teachers, policy makers, scientists and researchers. In his Welcome Address, the Vice-Chancellor, Professor Oluwafemi Olaiya Balogun, represented by the Deputy Vice-Chancellor, Development, Professor Felix Salako, commended the commitment of WANOART at bridging skills gap in Organic Agriculture in West Africa, through manpower training. He noted that the Workshop was “strategic and important because of the need to proffer solutions to the intractable food security challenge ravaging over 300 million population of women and children in the West Africa Sub-region”. Professor Balogun explained that “Organic Agriculture, which is the current trend in sustainable and healthy food production globally is a unique way of producing, handling food and fibres in an environmentally sustainable way, by exploiting the benefits of ecological cycles and deliberately excluding the use of agro-chemicals, which could be harmful to human health and the environments now or in the future”. 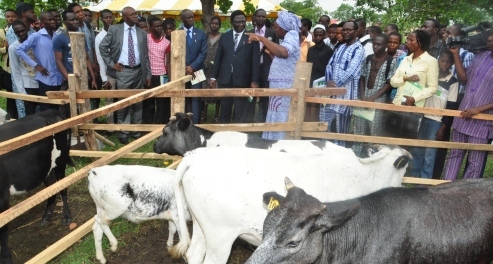 The Vice-Chancellor reiterated the University’s interest in the outcome of the meeting while assuring that its commitment to Organic Agriculture remained as strong as it was in 2004, when it inaugurated the Working Group on Organic Agriculture which eventually brought about the Organic Agriculture Project in Tertiary Institutions in Nigeria (OAPTIN). “No effort will be spared in keeping the vision alive. We want to continue to take the lead in breaking new frontiers in learning and research; we shall continue to collaborate with other institutions in Africa that are also passionate about food security and sustainable development”, he added.